The Sagittarius personality is naturally enthusiastic, curious, positive, and energetic. There's no question about it, Sagittarius is the biggest wanderer of the zodiac and is on a constant quest for happiness. Sagittarius traits include being serene, optimistic, and adventurous. With their jovial and naïve nature, Sagittarius has a tendency to head for the hills when drama arises. How well do you know the Sagittarius zodiac sign? Are you really a Sagittarius? What is a Sagittarius man like? Who does Sagittarius not get along with? Do Sagittarius and Sagittarius get along? Sagittarius is symbolized and represented by the mythical Centaur, the Archer. The Sagittarius zodiac symbol is portrayed as an arrow pointing upwards; embodying the need to do great things. The upwards pointing arrow is also said to represent Sagittarius’ optimistic and happy-go-lucky attitude. We think the zodiac symbol really represents the essential Sagittarius traits! Sagittarius zodiac sign dates are between November 22 and December 21. Sagittarius is the ninth sign of the zodiac and is one of the Fire signs. Sagittarius people are easily recognized by their happy and bubbly personalities as well as their upbeat attitudes. Ready to find out more about the Sagittarius traits? What is Sagittarius' ruling planet? The ruling planet of a Sagittarius is Jupiter. Jupiter is the 5th planet from the Sun and the biggest planet in the solar system. Jupiter symbolizes heroic action, success and bravery. The 5th planet is the master of everything that is fast and impacting. Jupiter’s influence on Sagittarius can be negative because the planet encourages Sagittarius to spend their money on unnecessary things. As their ruling planet, Jupiter encourages Sagittarius people to make the most of life and go with the flow. Discover the influence on Sagittarius rising. Here are 10 facts you must know about the Sagittarius traits. Discover 15 shocking facts on Sagittarius. 'Sagittarius people are attracted to other who know themselves and have strong personalities'. Sagittarius personality: What are the characteristics of a Sagittarius? As a Fire sign, a Sagittarius is skilled at sharing ideas and taking courageous steps to make their goals a reality. Like Aries and Leo, Sagittarius needs to keep moving and travelling in order to feel good about themselves. Rather than staying at home, the Sagittarius personality prefers to explore and see the world. How well do you know the traits of the Sagittarius zodiac sign? Understanding the Sagittarius personality will help you build better relationships with Sagittarius people in love, work and life. Let’s take a look at Sagittarius' 5 biggest positive and negative traits. Known for their honesty, the Sagittarius personality can sometimes be a little too impatient and can lack tact when communicating. Sagittarius loves putting their opinions across and can at times seem hurtful and insensitive towards other people. Sagittarius people are also very disorganized and are known for their impulsive nature. Sagittarius woman traits include having unlimited enthusiasm, a superb sense of humor and being curious. Sagittarius woman have reputations for being bold, feisty and independent characters. They are most definitely the wild child of the zodiac and love living life to the fullest. A Sagittarius man is like no other and is arguably the most energetic and free-spirited of the whole zodiac. Sagittarius men need adventure in their lives, if not they get bored and will look elsewhere for excitement. Sagittarius male traits include being very intuitive and great at reading other people's emotions. Jupiter’s influence on a Sagittarius males makes them hungry for freedom, adventure and success. Sagittarius compatibility: What zodiac signs are most compatible with Sagittarius? The most compatible zodiac signs with Sagittarius are Aries, Leo, Libra and Aquarius. Sagittarius and Aries are a solid love match and share a common love of adventure and the great outdoors. Sagittarius and Leo are also very compatible due to the fact that they are both on the same wavelength. This pair just get each other therefore have a deep understanding of the other. Sagittarius and Libra make for a real chatty and sociable duo. And as for Sagittarius and Aquarius, they really have similar personalities and simply just get each other. Who does a Sagittarius not get along with? The least compatible signs with Sagittarius are said to be Virgo and Pisces. Sagittarius and Virgo will have a hard time trying to make their relationship work because they are simply too different. The truth is this pair doesn't have a lot in common. When it comes to Sagittarius and Pisces, although they are both ruled by Jupiter, their values are just too different. Their difference in character means they are totally incompatible. Two Sagittarius people are an exciting and unpredictable love match. Who knows what could happen with these two together! With two Sagittarians together, sparks will definitely fly in the bedroom. Although, this duo should try and forget about their need to be in control, because it will eventually push them apart. Are you into a Sagittarius? Check out 5 Reasons to fall for a Sagittarius. What's in store for you today? 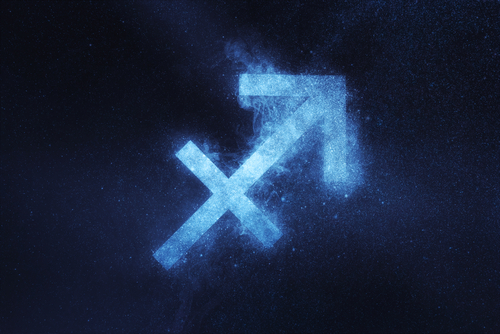 Read the Sagittarius horoscope today! Will this week be a good one? Find out in the Sagittarius weekly horoscope. Sagittarius, discover your destiny NOW! CHECK OUT THE OTHER ZODIAC PERSONALITIES! Capricorn personality traits Capricorn no longer has any secrets to keep! We reveal all! Virgo Traits Discover Virgo's best and worst character traits here! Taurus personality traits Taurus will no longer have any secrets to keep! Check them all out! Pisces Traits Pisces no longer has any secrets to keep thanks to our personality study! Scorpio Traits Scorpio no longer has any secrets to keep! We reveal everything! Cancer personality traits Discover all the essential characteristics of a Cancer. Aquarius Traits Discover all of Aquarius' secrets and get a better idea of their personality! Libra personality traits Libra no longer has any personality secrets left to keep! Gemini personality traits Gemini, discover your best and worst traits, as well as your master planet! Sagittarius Traits Curious about the Sagittarius personality? We have all the answers you need! Leo personality traits Leos, discover your qualities, flaws, preferences and master planet. Aries personality traits Aries will no longer have any secrets to keep! Get the essential information here!